Collins Booksellers - 101 Writers’ Scene Settings by Paula Wynne, 1230000999731. Buy this book online. 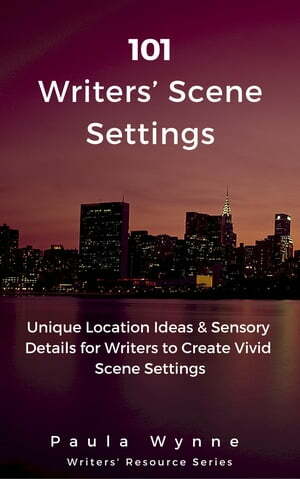 Make your novel’s scene settings come alive to your readers with mood, senses, atmosphere and vivid descriptions shown through the point of view of your characters. This book will guide you through choosing settings with mood, atmosphere and sensory details that will influence your characters. In films like Bourne or Bond you see baddies chasing the hero through crowded towns with tight corners and narrow streets or racing across roof tops. In other classic films you may see the most unusual places on earth and wonder how the studios found those places to feature in their films. Clearly they have endless budgets with numerous bodies to scout for locations. But what if there was a resource where writers could dip in and out to find these special types of locations for setting their scenes? Now there is!